Sony NEX-6: Inexpensive, Compact, Slick Handling—The Perfect DSLR Compromise? Sony's been grinding on compact, interchangeable-lens cameras: It's got three different lines (NEX 3, 5, 7) going at different price points, and they're all spectacular. The Sony NEX 6 is the latest for everyone who loves using the high-end NEX-7 but hates the price. What you're looking at here is the same image quality and Wi-Fi as Sony's recently announced NEX 5R, plus the built-in digital viewfinder and buttons and dials operation borrowed from the Sony NEX-7. 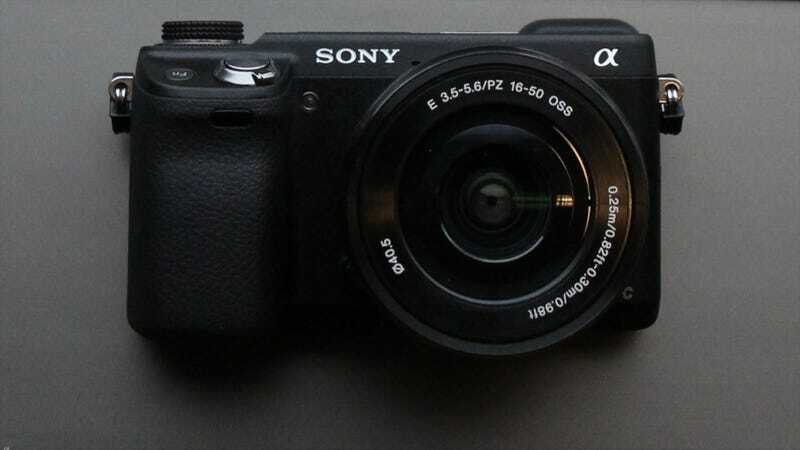 The NEX-6 will be bundled with Sony's 16-50mm power zoom lens for $1000. The body alone will cost you $850—not a bad deal considering the new very slim lens will ship in January for $350. Like the Sony NEX-5R, the NEX-6's killer new feature is a souped up new "Fast Hybrid AF" system that uses both contrast and phase detection to zero in on the subject you want in focus super fast. It also has the same DSLR-quality imaging: a 16.1-megapixel, APS-C sensor plus the rare ability to shoot HD video at up to 1920 x 1080 at 60 fps. Since the NEX-6 is equipped with the Wi-Fi powers of the NEX-5R, you'll be able to transfer photos and video wirelessly to your smartphone, tablet or computer. You'll also be able to use the Wi-Fi to install new PlayMemories Camera Apps, which are basically filters and special effects you can download and install on camera. The NEX-6 doesn't have a touchscreen—the NEX-5R does—and instead hopes you'll be interested in the DSLR-like mode dial on the top of the camera. That, along with the digital viewfinder, makes the NEX-6 all about capturing the "real" camera feel—down to the textured rubber grip.